VIMS professors Walker Smith and Deborah Steinberg will provide expert testimony during a simulated bi-national marine commission hearing on Friday, March 22, 2013, from 2 to 5 p.m. The purpose of the simulation—which will take place concurrently in Williamsburg, Va., and Montreal, Canada—is to determine how legislative hearings can best use modern technology to enhance success, efficiency, and transparency. The event is a joint initiative of the Center for Legal and Court Technology, a component of the William & Mary Law School, and the National Center for State Courts. Working in conjunction with the University of Montreal's Cyberjustice Laboratory, a fictional commission will use state-of-the-art technology to conduct a quasi-legislative inquiry with panels working concurrently in Canada and the United States. The joint commission will focus on a fictional occurrence in which the U.S. Coast Guard has intercepted “Sam Steuer” of the “Pacifica Marine Life Preservation Foundation” shortly after his release of approximately 250 tons of iron filings into international waters west of Washington State and Vancouver Island. 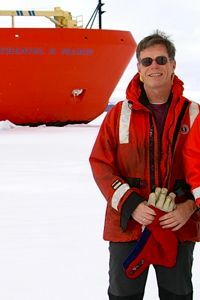 He has done so to create an experimental plankton bloom that will capture carbon dioxide, thus helping to remediate the effects of global warming. Such "geoengineering" is controversial as well as unlawful in at least some areas. Smith and Steinberg will provide expert testimony concerning the environmental pros and cons of this “iron enrichment,” an idea first proposed by oceanographer John Martin in the late 1980s. Martin, who once famously quipped, "Give me a half a tanker of iron and I’ll give you another ice age," hypothesized that phytoplankton growth in large areas of the ocean was limited only by a lack of iron, an important micronutrient for plant growth. Oceanographer John Gribbin was the first to suggest that greenhouse warming might be reduced by adding large amounts of iron to the ocean as a fertilizer for aquatic plants. Smith has been involved in several high-profile international programs to test whether iron enrichment might really work (the consensus is that it is not as effective as originally thought, and has unforeseen ecological consequences). He has been tasked during the simulated hearing with arguing the merits of iron-enrichment experiments. 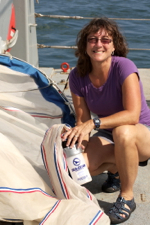 Steinberg’s research focuses on zooplankton, which play a key role in marine food webs and carbon cycling by grazing on phytoplankton, including any that might be nurtured by iron enrichment. Zooplankton carcasses and feces are heavier and faster sinking than phytoplankton, providing a means to quickly export carbon to the deep seafloor, where it contributes nothing to current global warming. She will argue the disadvantages of iron enrichment during the simulated hearing. Members of the fictional commission will use Smith and Steinberg’s expert testimony and other lines of evidence to make recommendations to the governments of both nations as to potential executive or legislative action. The pair's participation in the hearing is just one example of collaboration between VIMS researchers and the W&M Law School. Another is the new Virginia Coastal Policy Clinic (VCPC), which provides science-based legal and policy analysis of environmental and land-use issues affecting the state's coastal resources and educates the Virginia policymaking, non-profit, legal and business communities about these subjects. 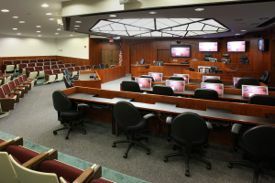 The Williamsburg hearing will take place in William & Mary Law School's McGlothlin Courtroom, the world's most technologically advanced trial and appellate courtroom. The Montreal hearing will take place in the University of Montreal's Cyberjustice Laboratory, Canada's most technologically advanced courtroom. The commission's technology will include extensive use of videoconferencing to enable the two panels to work together, remote testimony, cloud-based access to relevant documents, electronic display of evidence, and a real-time multimedia court record. The press is welcome to attend. Seating is limited. To inquire about availability, please contact the Center for Legal and Court Technology at (757) 221-2494 or [[w|clct]].